Wild Thing: Willet or Won't It? ﻿﻿﻿﻿﻿Beachcombing bird says its own name but gets no answer. “We, we, willet ... we, we, willet!” The high-pitched yell reverberated in my ear as I dodged a dive-bombing bird on Bolivar Peninsula back in my college days. The cause of this avian agitation became apparent when I spotted a bird’s nest tucked in the coastal marsh grass, a stone’s throw from the beach, holding four darkly speckled olive eggs. This menacing bird was simply being a good parent — it wanted me far from its nursery. I leaned down and saw that the eggs were perfectly positioned like a sliced pie, with the pointy ends inward and the wider ends out. After a quick peek, I backtracked respectfully to leave the nest alone. I looked up to view the bird aloft. Being a bird-watcher, I already knew what it was even before eyeing it simply because it’s one of a few birds that, along with a few added notes, recites its own name: willet. Though there’s not much “bling” to the pale gray willet, the striking black-and-white wing pattern of this large gray shorebird makes it easy to identify in flight. No other shorebird in our state is similar in this regard. Standing a foot tall or more and ever alert, willets demonstrate great posture and poise. Along the beach, they walk or briefly run in search of food to grab with straight, stout bills. These thick-legged surf runners work the wet sand in search of tiny fish, crabs, insects or worms. It’s best not to approach too closely to observe these birds — use binoculars instead. Here’s a tip for beachgoers who enjoy wildlife: Please keep your dog on a leash. Dogs can’t resist chasing the gulls, terns, shorebirds and other birds along the beach. You might think it’s adorable, but it can cause undue stress and fatigue to the birds. 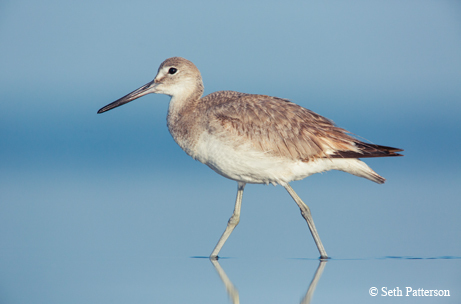 Give your feathered beachcombing neighbors the space and respect they deserve — after all, willets have been on the Gulf Coast longer than we have. Gulf beachcombers can spot a willet any month of the year. Two lookalike migratory species may be involved: the eastern willet, which breeds along our Texas Gulf Coast, and the western willet, its wintertime replacement. For now, the two are classified as subspecies under one name, willet. Will it or won’t it be split into two species? That is the question. For now, I’m fine with the ones we’ve got.